I know it will be soon. You will go to the garage, pull out your ride, your machine, your Wing, or whatever you call your gorgeous Gold Wing, and go for a spin. How far you go isn’t figured into the ride because distance is not a factor. Where you go is only a thought that motivated you to head out in the first place, and if you are like me, the destination can change with simply turning left instead of right. When you began this journey, you decided that only time was the deciding factor, and yet again like me, time becomes as flexible as destination and distance. This is exactly the feeling at the beginning of each journey that most Gold Wing riders will share with you. From a 2016 GL1800, all the way back 41 years to the 1975 GL1000, every GL has had state-of-the art comfort and smoothness. Each year it was manufactured, style and dependability were the focus for improvements and Honda never looked back. Or did they? The 1975 actually hit most markets by May of the same year because unlike other years, Honda began production in late January of ’75. All other manufacturers had as much as a five month head start on the GL1000. Kawasaki, Yamaha, Suzuki and BMW had already entered the year with their “big guns.” Honda was slated to manufacture around 20,000 GLs for 1975 and they got close. However, because of poor sales in the beginning, they scaled it back to around 18K* units. They also took a gamble and made very few changes for the ’76 model year with some frames and engines taken from the ’75 units being produced. One color was introduced for 1976 and that was Sulfur Yellow. But even that color was minimally produced because of its early rejection by the purchasing public, as well as notable dealer dislike of the Sulfur Yellow Prototype serial number GL1-1000002 shown in Las Vegas, at the 1974 Dealer Show. This flat four cylinder, 999 cc, water cooled, shaft driven, under seat fuel tank design was a huge gamble for Honda and their investment was substantial at the very least. Was the GL1000 Gold Wing going to be what they had hoped it to be or was it destined for eventual failure? In the very beginning of introducing their Prototype units shown at the same September 1974 Dealer Show in Las Vegas, two of these five units had a frame mounted fairing attached. Most dealers who attended were unimpressed, but as time went on, these same dealers began to buy the recently developed aftermarket frame mounted fairings because you and I, the buying public, decided that the missing components to complete this extraordinary machine was a touring package. The marketing folks at Honda began to envision the real possibility that the Gold Wing was and should be thought of as a touring motorcycle. As early as mid-1976, the decision was made to offer their own bolt on touring packages that would be available with the ’78 production GLs. But once again, the styling of the ’78, as well as the ’79, was a slow seller. Much of the loss was due in part to the faux tank and its departure from the more stylish ’75, ’76 and ’77s. Many buyers were uncertain about the stamped and riveted wheels as well. One item was for certain – the Gold Wing engine was a bulletproof design and still ahead of all the other manufacturers. In 1977, the manufacturing year of the ’78 model, the serial numbers began with GL1-40000xx and ended with GL1-4051xxx. I have located ’78 numbers that bear this out. There seems to be 51,000 GLs manufactured in ’78, but with weak sales, this number wouldn’t make sense unless some of those numbers were also 1979 models as well, which began with GL1-41000xx. The mystery here is why would they build the ’78 and the ’79 together? Conjecture on my part is that this is a possibility. However, the fact remains that the evidence seems to bear this out – serial number plates show the month made, as well as one that is GL1-4051xxx. While the market for the ’78 was weak but solid, it seems doubtful that 51,000 1978 models were built in 1977 when around 20,000 were built in earlier years. What if in 1977 or early 1978, Honda began, in earnest, another full design phase of the next model of the venerable Gold Wing? What if they upsized the displacement to 1085 cc without changing the engine design in order to concentrate on the second generation Gold Wing? It was to be a stand-alone grand touring unit complete with Honda developed fairing, lowers, a two-up seat, saddlebags and a trunk. All of this would be an unprecedented change that would bring to the market the true icon of this and future touring machines – the 1980 GL1100 Interstate. 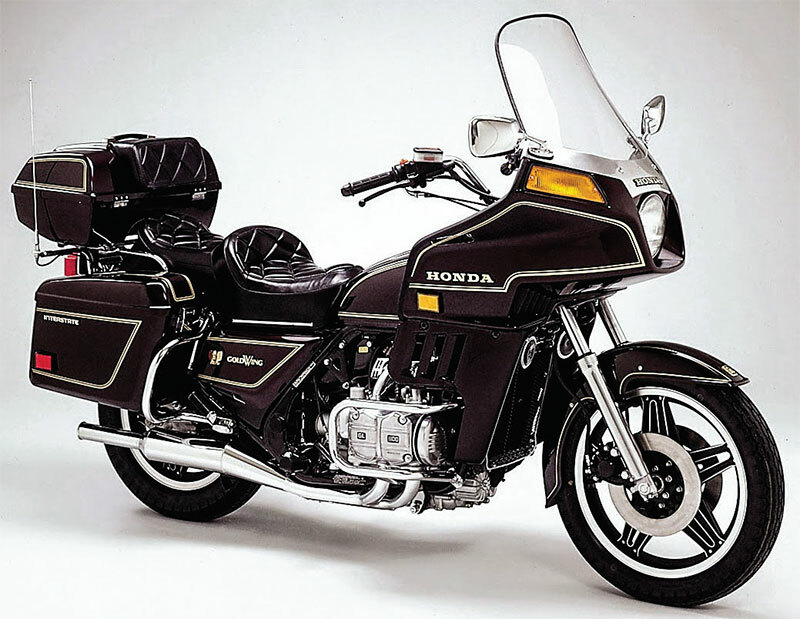 A perfect description of Honda’s dream was to take the Gold Wing into the touring class. It was a very new market area and a new level of Honda, utilizing a design perfectly suitable for any road trip on one unique, comfortable and smooth package. If this path were true, it would be a very interesting part of the evolution of the Gold Wing. My research is ongoing. *Data in this article is based on the known information gathered at the time of writing. Posted 07/12/2016 by wing & filed under Featured, Tech. The marketing folks at Honda began to envision the real possibility that the Gold Wing was and should be thought of as a touring motorcycle.